On running the application you should have a blank page with the app bar. There are two buttons to capture the photo and to save the captured photo on the disk. On the click event of the cmdCamera button we will capture a photo using following code. As you see on the cmdCamera button we are calling the startCamera function which is shown above. 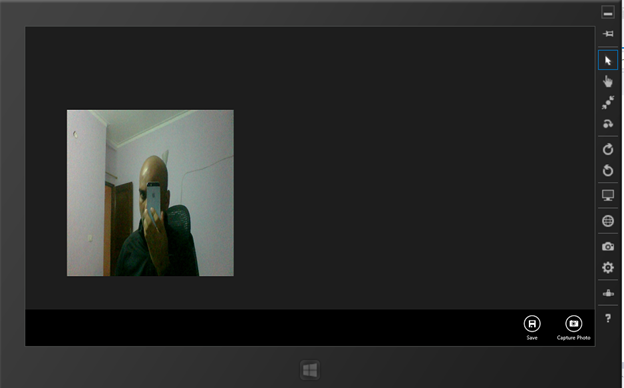 In this function by using the Media.Capture.CameraCaptureUI capturing the photo and binding that to an image control. On the other hand on the click of cmdSave we are saving the image on the disk. The captured photo is saved in the picture library using the instance of Windows.Storage.KnownFolders.picturesLibrary. The captured image is saved with the name photo.jpg. I hope this post is useful. Thanks for reading. Happy coding.